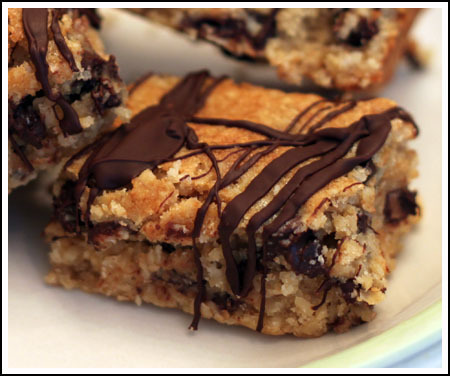 This recipe for Oatmeal Chocolate Chip Bars is adapted from one in Family Circle. I made the bars as directed, but spaced out and added an extra egg. I didn’t realize my error until I went back to the original recipe to read reviews. It turns out a lot of people thought the recipe would be better with an egg. Were they right? Well, I wouldn’t know. The version with the egg was great, but I think these would be good without it too. The most important thing is to measure the flour accurately and to let the bars cool completely. I thought they had an even better texture after being chilled and brought back to room temperature. Preheat oven to 375 degrees F. Line an 8 inch metal pan with foil and spray with cooking spray. Mix together the flour, baking powder and salt; set aside. Beat the butter and sugar with an electric mixer until fluffy. Beat in vanilla. Reduce speed to low and beat in the egg (if using) and milk. By hand or with lowest speed of mixer, stir in the flour mixture. Stir in oats and 1 cup of the chocolate chips. Spread batter into prepared baking pan. Bake for 28-32 minutes or until wooden pick inserted in center comes out clean. Cool completely on a wire rack. Melt remaining 1/4 cup chocolate chips in microwave or in a double boiler and drizzle over bars. Chill to set chocolate. Lift from pan and slice into bars. These were SO good! I had also found the recipe in Family Circle! So yummy….my hubby and I devoured the entire pan in less than 24 hours! I want one of those right now! Thanks for the tips on the egg/no egg. These look incredible! I’m gonna have to make these soon! Wow! These look amazing, and I’m sure they taste even better! 🙂 I just made some s’mores cookie bars from bakingbites.com – So, I suppose I’ll try these, too. Love sweets! I’ve never had an issue with a recipe from Family Circle! They must have a good test kitchen! Now this looks wonderful, Anna. I do love bars…never have seen a recipe for cc bars before. These look doughy in the center, which is the way I like my cc cookies! I love oaty bars, especially with chocolate. These look fantastic! Oatmeal chocolate is my favorite and in a bar? LOVE IT! Yum! I’m glad I’m not the only one who does things like that. When I was making that German Chocolate Cake the other day I accidentally put the entire can of evaporated milk in the frosting. Fortunately I realized my error soon enough and was able to skim off what I needed to! These look like good bars. Thank you for posting them! I made these last week – such a great simple recipe! Love oatmeal bars…they’re sweet and somehow the oats give them a bit more staying power than your average sweet treat! And with the brown sugar and dark chocolate!? Yum yum yum! I love recipes like this. I do a lot of vegan versions of recipes and likely leaving out the egg will result in a softer, perhaps slightly more gooey bar. I’ll definitely bookmark this one to try.